Spent ten minutes playing around with Font Squirrel’s FontFace Generator. Uploaded The League of Moveable Type's “Chunk" font and uploaded the results to Staticloud (free static site hosting): http://chunk-test.staticloud.com/. Looks promising. Looking forward to implementing this on an actual app and testing to see how it works/degrades across browsers and devices. @fixie I’ve used it. Worked great! @fixie I use font squirrel all the time. Love it. Only way to embed fonts. 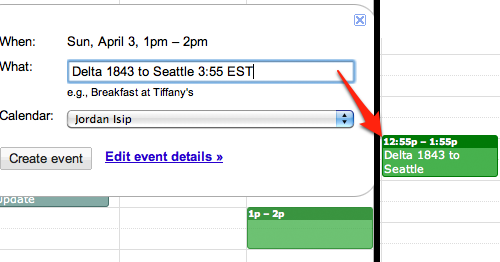 Google Calendar continues to impress me. While creating a new event, adding the time w/ time zone in the event description field will save it in the time slot of your time zone (based off of your settings). Eg. “3:55PM EST” results in “12:55PM” on my PST time zone calendar. Google understands the common confusion people have when scheduling events in different time zones and they provide a quiet solution for this. I imagine a common use case could be a user clicking on “2PM” to start creating an event, and then realizes halfway through entering the description that it’s actually 2PM EST. By being able to set the time via the textbox, this saves the user from having to close the new event modal, go back to the calendar view, click a different time slot, and re-enter description. Therefore, minimizing the amount of interactions that have to take place in order to schedule an event. These small details add up to help reduce user frustration while interacting with the app. Although, one way Google could take this one step further would be to allow duration to be set by entering the end time as well as the start time. I would love to enter “[event description] 12:55PM EST - 4:55PM EST” after I had already opened the new event modal instead of having to go back to my mouse and drag the duration. Obviously I can edit the event after it’s been created or drag the duration before creating the event, however, that is often not my workflow. I spent a couple minutes wondering why someone had closed my Hockey Team’s Facebook group. It turns out that “Closed” actually means that only members of the group can only see posts. Makes me wonder why Facebook choose to use “Closed Group” over “Private Group”? Joshua Porter has an excellent article on Writing Microcopy.